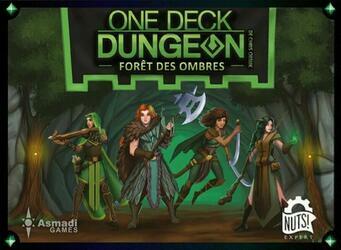 One Deck Dungeon: Forest of Shadows is an independent expansion for One Deck Dungeon (you can combine the two or not). It contains new heroes, new dungeons, new perils, new enemies and new mechanisms. One Deck Dungeon is a "roguelike" card game - a different dungeon each time, hard to survive, with a character you will evolve from scratch. The game consists of different enemies and other perils. Each map describes both the hurdle to overcome and the potential rewards. When you beat a card, you claim it to gain experience, an item or skill, placing it under the appropriate side of your character card to show its benefits. The more you take the time to explore the dungeon, the deeper you will dig and the faster the difficulty will increase! If you go far enough, you will have to fight the dungeon boss. Survive, and you will be a legend!